JBI International is a non-profit organization dedicated to meeting the Jewish and general cultural needs of the visually impaired, blind, physically handicapped and reading disabled - of all ages and backgrounds - worldwide. Founded in 1931 as the Jewish Braille Institute of America to help the blind and visually impaired in the United States, JBI now also provides services in Israel, the Former Soviet Union, Eastern and Central Europe, Latin America, Western Europe and all English speaking countries. 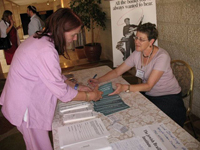 For nearly 80 years, JBI has provided people of all ages who are blind, visually impaired or reading disabled with books, magazines, and special publications in Braille, Large Print and in Audio format that enable them to maintain their connection to the rich literary and cultural life of the Jewish and broader community. The services provided by JBI, which are free of charge, enrich the lives of over 35,000 children, adults and seniors worldwide. JBI Talking Books are available in English, Russian, Yiddish, Hebrew, Hungarian, Romanian, Polish and the newest addition, Spanish. The JBI Circulating Library forms the cornerstone of the agency's work. It allows blind, partially sighted and reading disabled young people to receive a Jewish education alongside their sighted friends; it keeps the elderly, many of whom are coping with sudden vision loss, involved in the community of culture in which they grew up. JBI is dedicated to reaching out to seniors, their families and caregivers in an effort to raise awareness of JBI's unique services. The JBI Library, which is an Affiliated Library of the United States Library of Congress National Library Service for the Blind and Physically Handicapped, has the largest collection of Jewish interest books in the world for the blind, visually impaired and reading disabled, containing well over 13,000 Talking Books, as well as several thousand Braille titles and Large Print materials. The Library uses the broadest possible interpretation of "Jewish interest" when selecting materials for its collection, which encompasses poetry, fiction, history, biography, short stories, humor, psychology and self help, Jewish studies, memoirs, cookbooks, mysteries and more. The Bible, a wide variety of Haggadot, the Yizkor service and prayer books for all major denominations are available in Audio, Large Print and Braille formats. Israel: The JBI Low Vision Clinic at the Sourasky Medical Center in Tel Aviv (formerly Ichilov Hospital) treats severely visually impaired children and adults with state-of-the-art, customized optometric devices. We recently established a dedicated Children's Clinic that offers a more congenial waiting room and examination stations outfitted with special equipment for the treatment of severely visually impaired young children. The JBI Low Vision Clinic also offers a special Mobile Screening Service to reach the homebound elderly who cannot come to the clinic for diagnosis and treatment. JBI has launched an outreach effort specifically aimed at informing visually impaired, blind and reading disabled English-speaking residents of Israel about our unique services. Russia, Ukraine, and Central and Eastern Europe: The JBI Library serves thousands of blind and visually impaired people in Russia, Ukraine, Hungary, Romania and Slovakia. JBI offers an extensive and growing collection of Talking Books in Russian, Hungarian and Romanian. A catalog in Cyrillic is easily accessed on the web. JBI also distributes books to Russian speakers in the United States, Israel and Germany. In addition to Talking Books, JBI offers a special audio magazine in Russian (The Russian Voice), a Large Print Hebrew/Russian Haggadah and the only Russian children's audio library of Jewish interest for the blind and visually impaired. JBI also sponsors summer recreational retreats for blind and visually impaired Jews in Russia. Latin America: Responding to requests from Jewish organizations in Southeast Florida and Latin America, JBI is now building a library of Jewish interest materials in Spanish. This program is serving the needs of visually impaired and reading disabled Spanish-speaking Jews in the US, Israel, Latin America and around the world. JBI offers a Large Print Hebrew/Spanish Haggadah, a growing number of Spanish language Talking Books, as well as an Audio version of the magazine Raices, "Roots," a Jewish literary magazine produced in Spain, and La Voz, a quarterly anthology of Jewish interest in Spanish. "Thank you for all your help. It’s wonderful to know that I can just write to you, and then receive hours, days and weeks of pleasure. That’s a wonderful gift."